The DatePicker is a control that operates like the Calendar control, allowing the user to select a date, but does so in a dropdown calendar that appears when the user clicks on a calendar icon in the control. 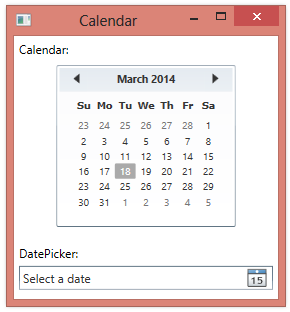 Unlike the Calendar control, the DatePicker allows selecting only a single date. 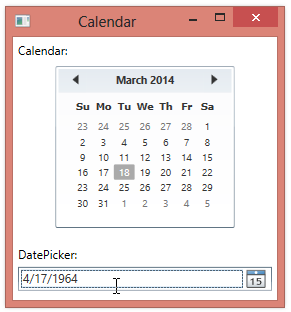 The DatePicker looks a bit like a TextBox, with an area to enter some text and a calendar icon to the right. If you click on the calendar icon in the DatePicker, a calendar appears as a popup, allowing selection of a date. Once you select a date, the date is then displayed in the text area. 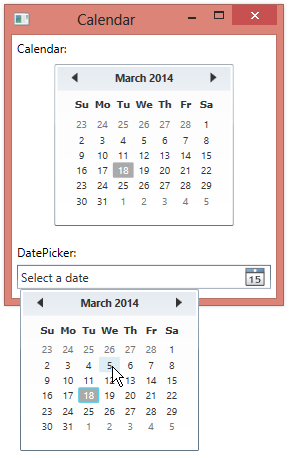 You can also type a date manually into the text area of the DatePicker.